The source code of the project is hostet on the Eclipse Communication Framework CVS. If you would like to become a committer please write me an email (reiswich@gmx.de). The main technologies used for this project are Eclipse Communication Framework and Eclipse Update API for managing updates, installs and uninstalls. You should now be able to run the client from Eclipse. 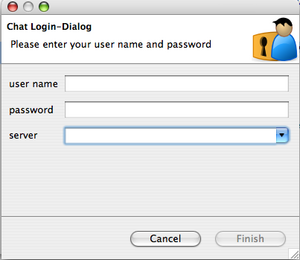 At the beginning a login dialog will prompt and ask you for the login information. If you are able to connect to your server first step is done. But bevore you are able to install/update or uninstall features you'll need to create a feature based product of your application. 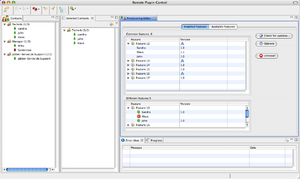 If you are using the mailexample client please create a product configuration based on your launch configuration. The next step you have to do is to create a feature for your product and initialize it from your product configuration. Now export your application and try to launch it. If you would like to play a bit around I've set up a simple feature in three versions which contains a view and a button. This features are are available from the following update site: http://eugenda.eu.funpic.de/upload/ Don't forget to restart the updated application to apply changes. For this purpose you can use the "Restart remote Application" button from the "Selected Contacts" view of the admin application. If your installation/update process works fine you should see the additional view with different names for the button (button v1, v2 and v3).